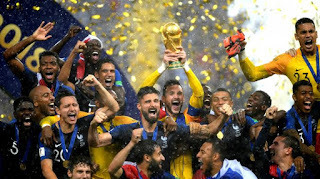 France wins Football World Cup 2018 by defeating Croatia 4-2 in a thrilling final match at the Luzhniki Stadium in Moscow on July 15. Croatia were playing in their first World Cup final. They were the smallest country to reach the Final in the modern era. For France, it was a first World Cup crown since winning on home soil in 1998. England’s Harry Kane won the World Cup Golden Boot Award as top scorer with 6 goals. Croatia captain Luka Modric won the Golden Ball award for the World Cup’s best player despite being on the losing side. Kylian Mbappe of France won the Young Player of the Tournament Award after scoring his 4th goal of the competition in the final. Belgium’s Thibaut Courtois won the Golden Glove award for the best goalkeeper. Now, France joined Uruguay and Argentina in winning the World Cup for a second time, after their 1998 triumph over Brazil when Didier Deschamps — now the coach — was the captain. Golden Ball Award: Croatian captain Luka Modric won the Golden Ball for the World Cup's Best Player. Modric won Man-Of-The-Match three times in Croatia's seven games in Russia. Golden Glove Award: Belgium's Thibaut Courtois won the Golden Glove award for the best goalkeeper. Golden Boot Award: England's Harry Kane won the World Cup Golden Boot. He was the top scorer with six goals. Young Player Award: France's Kylian Mbappe won the Young Player award. He scored the game’s finest goal and became the first teenager to register in the final since Pele in 1958. Fairplay Award: Spain was awarded the Fairplay Award for being the most disciplined team in the tournament. 6. Man of the Match in Final: Antoine Griezmann (France). 1. The Prize money for the champion team was 38 million US Dollars. 2. Zabivaka was the official mascot of the 2018 FIFA World Cup. 3. The official song of the tournament was "Live It Up", with vocals from Will Smith, Nicky Jam and Era Istrefi. 4. First time in the history of world cup VAR (Video Assistant Referee) system was used.